Dropbox can no longer rest on its laurels. Among new competitors in cloud storage and syncing industry, Copy is definitely set for a big bright future. Potentially hundreds of gigabytes of free storage, ease of use, cross-platform compatibility and extremely polished base product are going to tempt existing Dropbox users and lure the newcomers. But will Copy.com live up to our predictions and its current hype? Check out our review or sign up now. When we first heard of Copy.com, we exhaled and thought “yet another cloud storage and syncing services again!”. And we couldn’t be happier to be wrong. Far from our thought, Copy.com is actually a fantastic newcomer that we believe will change the game in online storage and syncing niche. It has addressed issues that we have trouble with other providers, and seems like they are prepared to take the industry by storm. So how fantastic is Copy.com? We can tell you about a few incredible things Copy.com has done right but perhaps the highlight will be on their storage, and their incredible referral bonus. Copy.com is created by Barracuda Network, a well-reputed player in market for network security, anti-spam, enterprise-level cloud backup, and application delivery. Copy.com is their latest product – an attempt to enter the lucrative consumer-level online storage and backup niche. Given their track record, we won’t hesitate to trust Copy.com with our data. We have reviewed over 52 online storage, backup and syncing services. And there are more to come. So it is safe for us to say that we know the industry like back of our hands. But we know that you won’t take our words for it, so here is a comprehensive review on Copy.com, right after the break. Copy.com currently offers 15GB free storage for anyone who subscribe. It is not a free trial, nor limited time offer. Just like what Dropbox offers, it is permanently free. And that is if you subscribe directly on Copy.com. More on this part later. Right now, they offer six plans in total in both Personal and Corporate plans. Free plan is part of Personal plan so that leaves 2 paid plans in it. Pro 250. $9.99 a month or $99 per year and you get 250GB of cloud storage. Pro 500. $14.99 a month or $149 per year. You will get 500GB cloud storage. If you need more than that, you can buy additional increments in 500GB for $149 per year each increment. 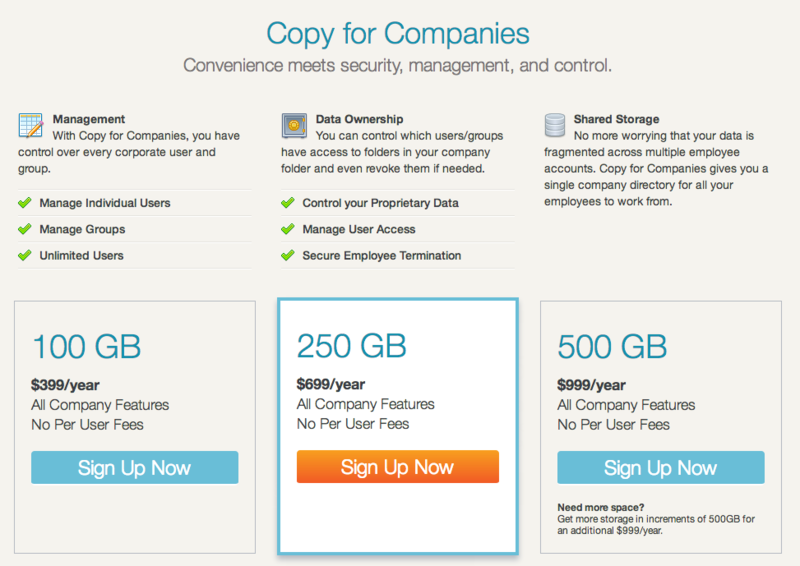 Copy.com plans for companies come with more features catered specifically for companies, and instead of limitation on users or charging per user, you can get a whole bunch of storage with all features for companies, and you can assign any amount of storage you want along with access privileges for any numbers of users. 100GB. It costs $399 a year, and comes with all company features. There is no per user features nor limits. 250GB. $699 a year will get you 250GB with all company features. 500GB. $999 a year will give you 500GB storage space with all company features. If you need more storage, you can purchase increments in 500GB at $999 a year. What makes Copy.com more interesting is its referral bonus. It is nothing new, since Dropbox, SugarSync and others also offer referral bonus storage space but what makes Copy.com more unique is in how many bonus you get. For each referral (sign up, install client app and log in), both you and whoever you referred to will get 5GB additional storage space. And there is no limit on how much you can get on referral bonus. Yes, there is no ceiling. We know of people who have already earned like 525GB or 600GB, and Barracuda promises that those referral bonus will stay forever. So yeah, Copy.com essentially redefines the meaning of referral bonus space! 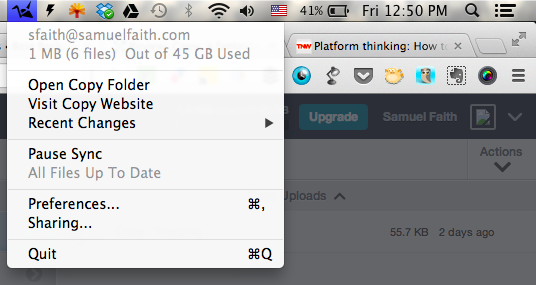 In comparison, you can get up to 18GB total free space from referrals with Dropbox. SugarSync will give you up to 32GB. Yup, you really can’t compare Copy.com with them in this aspect. Another win for Copy.com is in paid plans. Dropbox charges $9.99 for 100GB and $49.99 for 500GB. SugarSync will charge you $7.49 for 60GB and 250GB will cost $24.99. Those are monthly prices. Copy.com only charges $14.99 a month for 500GB. That is, of course, assuming you don’t have a vast network or people who will sign up through your links. It is entirely possible to get 500GB or so without spending a time. 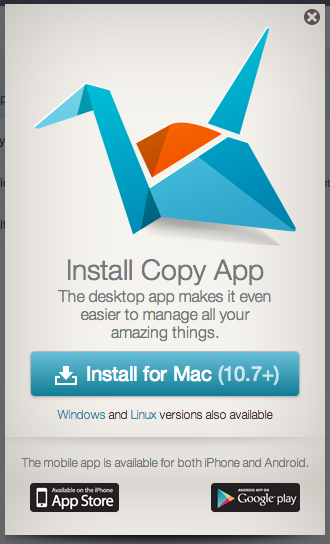 So in this aspect, Copy.com 1 – Dropbox and others 0! Cross-platform compatible. Copy.com offers desktop client apps for all three major operating systems: Mac OS X, Linux and Windows. This is impressive since most will just cater to Windows and Mac. Instead, they launch with client apps for all here. They also have mobile apps for both iOS and Android. No words on Windows Phone though. Cloud Syncing. You already know what cloud syncing is if you have used Dropbox. You put your files on your account at Copy.com, and every other devices logged in to your Copy.com account will automatically get the files you uploaded. “Any Directory” Syncing. Okay, we totally make up this name but it is exactly how it sounds. While Dropbox limits us to sync only files in a central folder (aptly named Dropbox), Copy.com lets you sync any directories on your computer. You can do this by creating a shortcut to that folder and place it within Copy directory. Not very intuitive like SugarSync though, which lets us do exact same thing within right-click menu. Permission-based Sharing. When you share your files and folders on Copy.com to others, you can set permissions for each. So basically, you can set permission to just “View Only” or “Can Edit & Sync” or even set permission based on files. Now this is a feature that Dropbox users have been begging to have. Copy.com addressed that. Fair Sharing. Fair sharing is another concept we feel that Copy.com has done it right. With Dropbox and SugarSync, when you share files to someone, the size of shared files will consume space on both accounts. So basically if you share a 1GB large file between two people, both will have to give up 1GB of their space for that file. Not with Copy.com. Let’s say you share a 3GB file or folder with a friend. Instead of consuming 3GB on both accounts, now only 1.5GB will be consumed on each account. The file size is split and shared between all shared accounts. If you share the same file to two more people, then only 750MB will be used on each users. 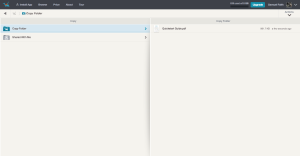 Using Copy.com and its desktop client app are incredibly easy. There is no guess work, and everything is pretty intuitive. So unless you have never used any cloud-based services before, we can’t really imagine why you would need customer support. Regardless, Copy.com has a web-based knowledgebase and support forum over at Zendesk. The knowledgebase covers a lot of issues and questions that you will have. If you have anymore questions, you can just submit your request through support forum. Simple as that. We didn’t test on response time here since all questions people will have are already addressed in the knowledgebase. We just couldn’t think of anything else to ask. Once you visit Copy.com, there is no complication on the home page, and it is pretty clear of what you can do. Sure, it has two call to actions: “Drop files here to share” and “Sign Up Now” prominently on the home page. But they are not that confusing. 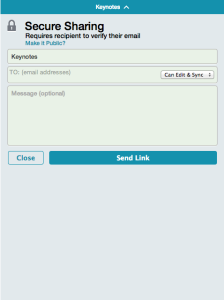 If you use Drop Files Here, then you can upload one file without signing up, and after it is uploaded, you will get a shared link to access your file. This is quick and easy way to share your files without having to sign up an account. Since it is web-based upload, there must be a ceiling on maximum file size you can upload so it is best to sign up an account if you are looking for long term usage. Signing up is also very easy and straightforward. You don’t have to fill in countless forms or whatnot. It only asks you for your first name, last name, email and password. 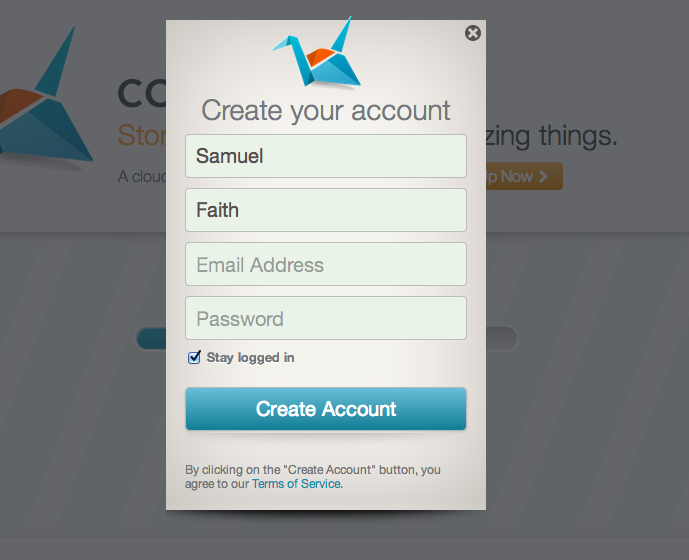 Then voila, your account will be created and you will be logged in immediately into your account. Such straightforwardness and simplicity are always welcomed in today’s world of clutter and chaos. Right after you log in, you will get this welcome dialog. It is basically a short tour, and will show you things you should know about Copy.com. It also comes with a short message for you to tweet it so that you can spread the words about Copy.com on Twitter. After the tour, this is the Dashboard of your account. The interface is very simple, and there is no complication. To the left, you see Copy folder and Shared With Me folder. The names aptly reflect what they are so we won’t explain what it is. When you click on either one, at the right panel, you will see all folders and files. The interface is intuitive enough that you don’t need to guess what is what. So did you see the arrows pointing right (>) beside the folders? When you click on it, you get what you see above. Those are functions you can do with that folder. You can download whole folder, you can rename it, or you can share it. You can also see file activity (for folders already shared). When you click on Share, this is what you will see. You can choose to share publicly or securely (private link). 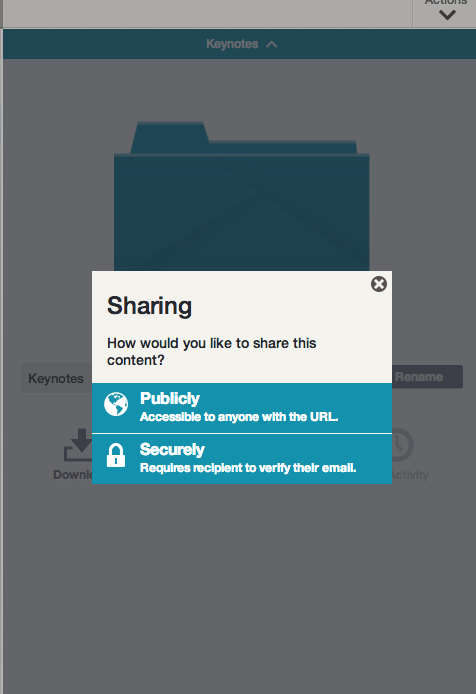 Everybody with a link for a publicly shared folder can access it. However, for privately shared folders, users must verify their email address in order to access it. So even if your friends give link to a privately shared folder, you will know exactly who accessed what based on the email address. 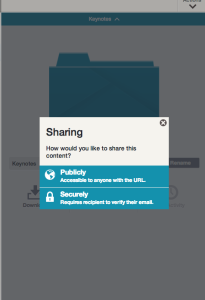 Public sharing will just give you a link, but Secure Sharing has an extra step for you. You have to enter email address of people you want to invite, and also set permission for each on whether you want them to view only or let them also edit and sync. 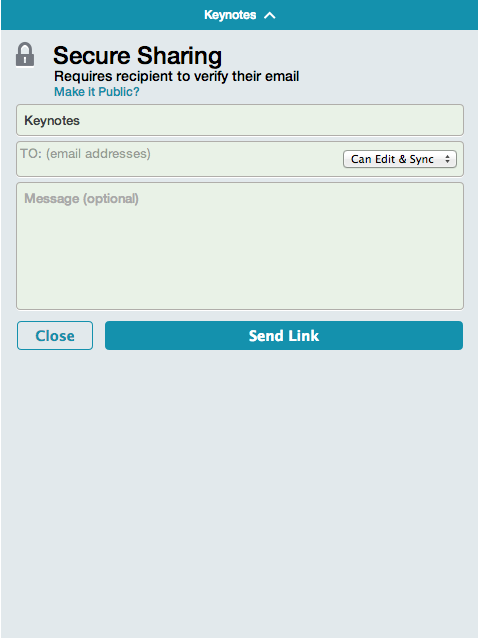 Then Copy.com will send an email containing a link to your shared folder. 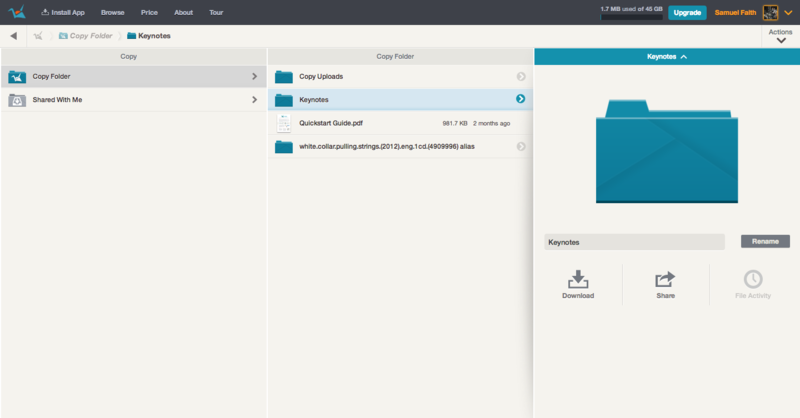 Right click anywhere in the right panel and you will be able to create a new folder or upload files using Copy.com web app. There is no bulk upload feature, as Copy.com intends you to use their desktop client app. You can just click on Install App on the top navigation menu, then you will be prompted to download the desktop client app for your OS (it detects your OS). If by any chance you want to download the app for another OS then there are also links right under the download button. Pretty nifty. Kudos to Copy.com team for their well-planned usability. It takes away guess work and extra steps from users, making the whole experience pretty seamless and smooth. We will skip the installation of the app itself but after you install it, you only have to log in and it will put an icon in your system taskbar. The menu items from the taskbar icon are pretty similar to Dropbox. We won’t explain other interfaces in Preference settings of Copy app but Sharing tab deserves a mention. Basically, here you can manage all your public and private sharing of your folders. You can manage permissions, and set which default directory will accept incoming shared files. Pretty useful. You can also use Copy Actions in right-click menu, which will only appear if you are right clicking in Copy folder on your computer. While Dropbox seems to be resting on its laurels and still enjoying the market leader position, others are catching up. And among those plethoras of cloud storage and syncing services, we can confidently predict that Copy will be taking a huge market share pretty soon. Sure, they still need to innovate more. Right now, there are no gallery views of photos uploaded, and its mobile app needs to play catch-up with SugarSync (which is great in streaming music, video, viewing documents and so on). But it was launched extremely polished, stable and usable so we have no doubt about its future. If you are looking for an efficient, decently fast, cross-platform compatible cloud syncing service with loads of free storage, then go ahead with Copy.com. Heck, even if you are already using Dropbox for years, still try them out. You will fall in love. We promise. Copy.com has the issues mentioned by Kenton Simons until today. It is great for getting a lot of space. However it is not reliable to make the files available. Files listed on copy.com can not be found by users with a valid link to it. They get nonsense error messages. If you want to distribute your files to friends or clients better find another place to do so. I moved to MEGA which offers 50GB and is highly reliable. As of today, the referral program IS limited. Luckily, I joined them long ago, and already accumulated enough referrals (over 1TB). Their service is great, and they keep improving it! I have been using copy for a few months, I have my own blog, so I used it as platform to advertise copy and get additional storage. my problem with copy started two months ago when I figured out that my main folder is missing. 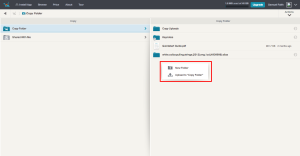 – what is the path of the folder with the issue? (even due it is already specified in the support form). I suggest to keep your distance from Copy cloud service. I have been using copy for a year and a half now. I have Dropbox and OneDrive as well, but Copy is much cheaper (especially when using over 250 GB). I use two alias’s in Copy, one for “My Documents” and one for my “iPhoto Library”, they are strictly for back up. Two weeks ago I deleted my entire iPhoto Library by accident and a few days later my Time Machine backup crashed. So I ended up losing 202 GB of photos. Photos that were irreplaceable. Since I deleted my iPhoto Library by accident it was also removed from Copy. So I contacted Copy support and after a few emails they said that they could replace the files, but that it would take time. It did take time, as the comments above suggest, it took almost 10 days, but in the end I had all of my 202 GB of photos back, photos that I myself deleted. I’m impressed with Copy and their Tech Support, very impressed. I am so impressed that I searched out this review of Copy to add my two cents. They saved my 202 GB of photos for me. Are they slow? You betcha they are, slower than molasses going up hill. But for a cheap cloud backup for large GB of data you can’t beat them. And for customer support they can’t be beat either. Like I said, I use Dropbox and OneDrive for my day to day management of files, and I’ve had issues with those services as well. But their customer support was no where near as good as Copy’s. So thanks Copy, you have my business now for a long time to come. It’s nice to know that even my stupidity is covered. All laments. Hmm. 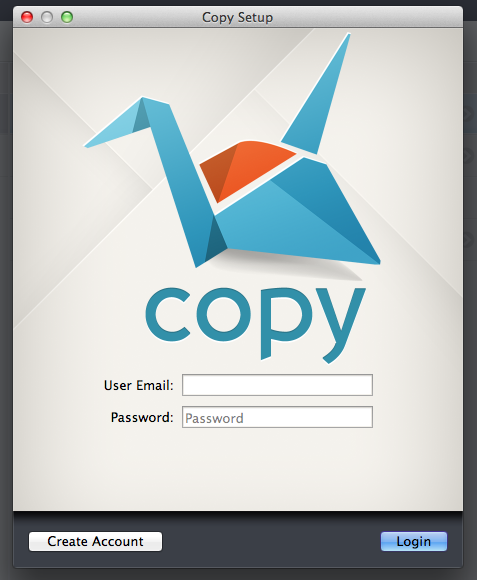 I’m quite happy with copy.com; to me it does beat dropbox. It usually updates changes fast, I have yet to find any problem, hunky dory. My qualm, and I informed copy.com already, though no change yet, the client (Linux) on one and only one of my machines consumes close to 50% of the resources. And it is a quad-core 4 GB machine. Strange. Yes, I can recommend copy.com; and I can’t say dropbox has worked any better for me; aside of that singular resource hog. I’ve been a dropbox user for the past 6-7 years due to samsung promotion (50GB of storage for 2 years), which is still going on for specific models and HTC devices offer 23GB. Having been used to so much storage, Copy is generous with its offering of 15GB (20 if you use a referral link). A lot of these other promotions only last a limited time and are used as a marketing tactic. They make you invest all of your time into their service in hopes that it would be too big of an inconvenience to not buy their premium accounts. From my limited used with Copy, it seems just as good if not better than most other cloud storage clients. Their app for mobile phones is simple and intuitive. I’m not sure if they offer 2-step verification which is offered in dropbox and googledrive, but you can set a passcode for the mobile app which is a great option. Obviously they offer automatic backup of your photos/videos. I was really hopeful that this service would be a Dropbox alternative (not that there is anything wrong with Dropbox). I’ve been using Dropbox to distribute photographs to clients, amongst other things, so I thought I would give Copy a go. After too many clients complaining they couldn’t access files, terrible upload speeds, being unable to access by files through the web from other computers, I have given up and removed all trace of copy from my machine. Don’t bother – stick with Dropbox. Quite why a product so flawed is released, I do not know. @jbosworth .. Why the heck would you use a cloud for development? Ever heard of versioning? Try something like bitbucket or github. It will give you what you need and MUCH more. does Copy automatically update files or do you have to update them manually? I’m thinking about Quicken files which change daily. This is an interesting info on copy.com. I just have one question: I have a webhost with an unlimited disk space! ; Is there any way to move my copy.com files directly to my webhost disk without having to download them first before reupload them to the webhost. thanks for answer me. I’ve been trying to integrate Copy into my web development workflow, and have had nothing but headache. I’m trying to keep two windows workstations and a linux dev server in sync and have found this service to be pretty undependable. I can’t maintain permissions, and I can’t ignore filetypes. The linux “CopyControl” daemon won’t stay running. Yes, I am trying to maintain over 30k files, but… isn’t that the point? I like their web interface, and I like how much space they give you, but I’m not sure this service is ready for primetime. It’s renamed not reuploaded completely. The biggest flaw I’ve found with Copy.com is the inability to “empty the trash”. When you delete a file or folder it’s moved to an undelete area where it can be recovered. Unfortunately, it stays there forever, using up your allocated space. If you upload a huge folder full of photos or videos or whatever by mistake, say good-bye to the space it takes up. Many users have complained about this, and the company has said they plan to offer a permanent undelete in the future, but so far nothing. Its a lot of storage, but the quality of upload is poor. It can’t handle a folder with a large number of files. The script crashes. I hope they improve it, but Skydrive and Dropbox are better, then Google Drive. It can’t be move or copy a file from the cloud. This service is so slow. I have uploaded 5 video files to dropbox in minutes for storage. In Copy it’s taken literally 2 days to do 2. The third is almost done now at the 4th attempt. Not impressing me one bit. DOG SLOW!!! And it seems that there is no automatic sync from your computer to Copy.com. I added a folder to my computer Copy folder, it does not appear on my Copy.com folder. here’s a question – what happens on a rename? According to someone in the support forum, renaming a directory causes an entire reload.